Summer time. Beach days and BBQs. Drippy ice creams and juicy mangoes. Oh Summer how I am going to miss you. But I won’t miss the incessant heat we have been experiencing of late. We have just come out of a heat wave. It has been so hot and so sticky and there is little relief. It’s generally too hot to be outside unless you are at the pool. And even then the pool water is bath water temperature so it’s not overly refreshing. And too many hot days have meant tempers have been rising along with the temperature. Enter this delicious Mango Banana Nice Cream. Have you made Nice Cream before? It’s a really fun and delicious way to serve fruit. We made this refreshing two ingredient Mango Banana Nice Cream for afternoon tea. The kids were sooo excited to be having ‘ice cream’ for afternoon tea and I was sooo happy that Mr 6 was willing to try mango again. For the best part of the summer Mr 6 (who last year loved mango) has not even wanted to try it. But when I said we were having mango banana nice cream he could not wait to eat it. Following his first spoonful he declared this ‘mango-riffic’. High praise indeed. You want to know the funny thing? Ever since that afternoon he has asked for fresh mango in his lunchbox and for snacks. As mango season is drawing to a near I have grabbed a tray and I will be freezing a lot of mango to use for nice cream and smoothies so fingers crossed Mr 6 continues to enjoy mango! 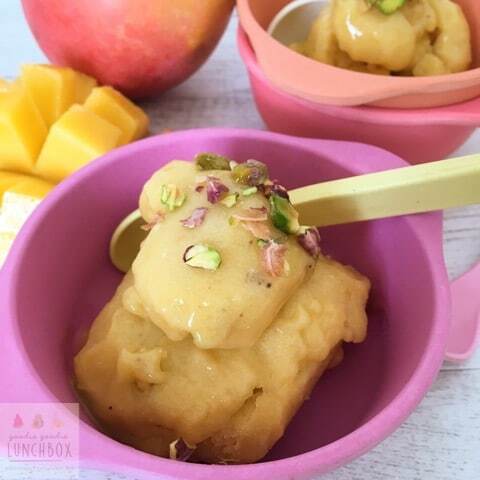 If you are having trouble finding mangos you can always grab the packets of frozen mangoes from your supermarket instead of freezing your own. Transfer the nice cream to a lined baking dish or tray and freeze again for 30 minutes before scooping out and serving in bowls or ice cream cones. 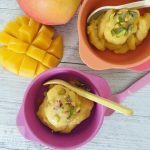 You can garnish this Mango Banana Nice Cream with crushed pistachios (or even add this to the mix so there is some more crunch) or sprinkle with desiccated coconut. 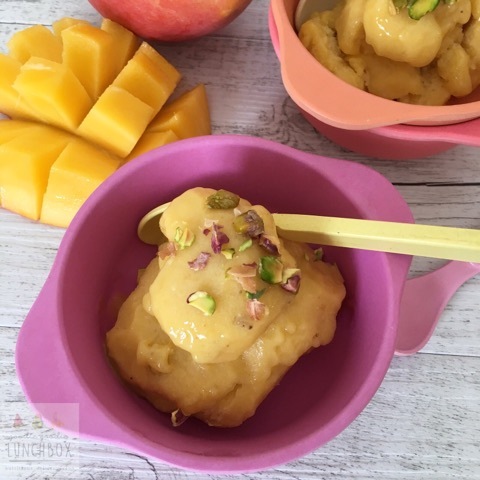 I hope your kiddos will enjoy this Mango Banana Nice Cream! If you make this or any of my recipes be sure to let me know what you think! Or take a picture and add to my Facebook community or tag me on Instagram!